Get in the holiday spirit with sounds of joy! The Old Time Fiddlers will perform beautiful Americana music with a sprinkling of holiday cheer to get you in the spirit. Come ready to clap your hands and tap your toes. Even get up and dance. This is a free family event that can be enjoyed by young and old. Bring your own wine and sip it in Ely Stage Stop wine glasses, available for purchase. Come early to enjoy all of the latest museum acquisitions and displays. A holiday MUST! Local artists will sell handcrafted goods in the barn. Food for purchase will be available. 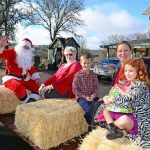 Join the museum volunteers and docents for a wonderful day on the museum grounds with Santa. He will be taking a much needed break from the North Pole to roam the grounds and join in hayrides with the kids – weather permitting. Both events will help promote the growth of the Ely Stage Stop Blacksmith Shop and further the interaction of the community with the history of Lake County at the Ely Stage Stop.